The 5th Wave meets Beauty and the Beast in this fast-paced and heart-stopping novel about an invasion of murderous creatures and one girl fighting for her life at the end of the world. He has no voice or name, only a rank, Eighth. He doesn’t know the details of the mission, only the directives that hum in his mind. Sixteen-year-old Raven is at summer camp when the terrifying armored Nahx invade. Isolated in the wilderness, Raven and her fellow campers can only stay put. Await rescue. Raven doesn’t like feeling helpless, but what choice does she have? G.S. Prendergast is the author of the award-winning and multi-nominated young adult novels in verse, Audacious and Capricious. 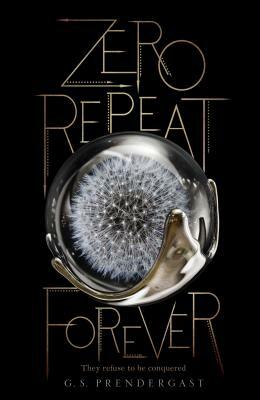 Zero Repeat Forever won the Sheila A. Egoff Children’s Literature Prize. She lives in British Columbia, Canada with her family. Connect with her on Twitter @GabrielleSaraP. "Detailed settings and swift action make this novel an edge-of-your-seat page-turner. Readers who enjoy post-apocalyptic literature and interspecies unrequited love stories will be drawn in to this story immediately." "Teens will love the pace and dialogue...As Raven and Eighth find themselves on an intersecting path, readers will be sucked into humanity’s struggle to survive and the Nahx’s all too focused efforts to ensure that it doesn’t. VERDICT A first purchase for teen collections."